Brake Rotors: Which are the Best for Me? To get the best of one's vehicle, maintenance is very important in order to keep it in good shape. This maintenance involves getting spark plugs and changing fitters and oil as well as keeping tire pressure up. Car brakes maintenance generally involves more than just replacing pads and constantly checking the fluid level. The brakes are a system that includes a part called a brake rotor. The brake rotors are vital to the brake system. Sometimes called brake discs, rotors are what the brake pads clamp onto in order to stop your tires and halt your vehicle. A lot of folks don't give their rotors and brakes a second thought, not understanding that they're just as important to the stopping power of their car or truck as the pads are. Let's have a look at the different performance rotors available, going over the pluses and minuses of each type so that you can get a better idea of what they are and which might suit your needs best. Drilled Brake Rotors - The Good and the Bad. One of the two main types of high-performance rotors are drilled brake rotors. As their name suggests, they have holes drilled into them. It is this holes that aid towards stopping vehicles. 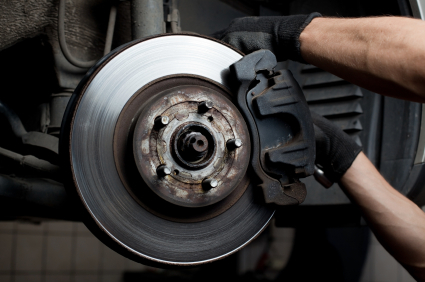 It is important to understand that, when a rotor is clamped onto by a brake pad, friction is created. The friction created causes heat. If there is no outlet for the heat, it causes brake fade which lowers the brake's stopping power. The other main function of the holes is to help in releasing gas. The last good reason to have a drilled rotor is water. A wet rotor is a slippery one and the brake pads have a harder time hanging on. When a vehicle uses a drilled rotor, it becomes very easy for the pads to clamp and therefore stopping the car. Weakening of the brake system is the negative side of using the brake rotors. As you may have considered at the outset, having a rotor full of holes means that the rotors are weakened and after a bit of stressful driving, the rotors can crack. The slotted rotor s make up the second component of high performance rotors and brakes . Just like the drilled rotors have holes, these rotors have slots on their surfaces which facilitate releasing of water, gas and heat. Slotted rotors are mainly used by those who use high performance vehicles because of high stress driving which their vehicles are involved in. The other reasons why they are preferred for high performance driving is because they are more durable. The downside of slotted rotors? They eat up brake pads like crazy.The cost of replacing the brake pads every time they get worn out is prohibitive, therefore unless one is into performance driving, drilled rotors should be utilized.